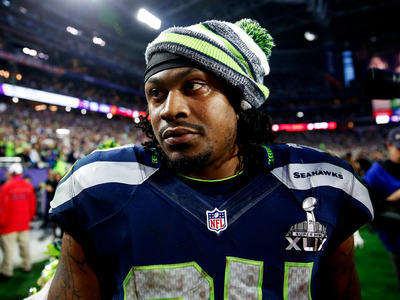 Shortly before Marshawn Lynch announced his retirement — during the Super Bowl, no less — a report began circulating that Lynch had never spent any of the $49 million he made during his nine-year career. Presumably, Lynch had been living off the estimated $5-million-per-year he made off of endorsements and other business ventures. Lynch recently sat down with Sports Illustrated’s Jon Wertheim in a wide-ranging interview and discussed the rumours’ of Lynch’s financial savvy. When Wertheim then said that people close to Lynch say he’s extremely smart with his money, Lynch gave a powerful reason why. He first asked Wertheim if he’s ever eaten cereal before. Wertheim said no and Lynch continued. Wertheim followed by asking what wealth means to Lynch, and Lynch again gave a meaningful answer. If Lynch is truly done with the NFL — and he insists that he is — he seems well-off, thanks to some smart planning ahead of time. He may not have all of that $49 million he’s made, but he has enough and he has his family and friends, which is all Lynch seems to care about.